Had the stars aligned slightly differently, we might currently talk of Bertrand Tavernier’s Death Watch in the same breath as A Clockwork Orange and Blade Runner, as one of the classics of modern cinema: a fearless and disturbing analysis of a modern society in which the desire for privacy is not so much seen as suspect but actively immoral, and where technology has turned people into voyeuristic ghouls. 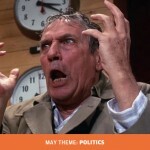 It would be proclaimed as a terrifyingly prescient essay on modern life as panopticon; a film which damns (and makes complicit) its audience no less than Peeping Tom or Funny Games, which is as paranoid and jumpy as The Conversation, while also, two decades avant le lettre, commenting on the modern day freakshow that reality TV would, by virtue of its organising principles, inevitably become. And – though its director was French, its cast international – it slips into a pantheon of sharp-eyed, pessimistic British sci-fi epitomised by the works of great TV writers like Nigel Kneale. As things stood, however, it had been largely forgotten, though its recent digital cleanup and current rerelease ought to remedy that. Production money came from six different countries; the cast is a weird amalgamation of European arthouse, hard-bitten Americans and unknown (though later to become famous) Brits; it was filmed at the dog-eared end of the 1970s in Glasgow, which though arguably dystopian enough, was nobody’s idea of futuristic, and it’s possibly this mishmash of money, people and subject which led to its consignment to the memory hole. Harvey Keitel stars as Roddy, a TV journalist with a camera implanted in his eye; in a future where death from natural causes has been elimiated, it’s his job to follow Katharine Mortenhoe (Romy Schneider), a publishing executive and author of trashy romance “computer books” as she succumbs to a terminal illness, her increasing decrepitude being broadcast nightly for a salivating populace. Harry Dean Stanton, who somehow manages to be simultaneously flinty and slimy, plays Vincent, Roddy’s producer; Max von Sydow, playing Katherine’s ex husband, Gerald Mortenhoe, towers over the film’s final reel. Meanwhile, in future British star bingo there’s Robbie Coltrane as a cup-and-ball-playing chauffeur, and Bill Nighy as Katherine Mortenhoe’s fey assistant. After the camera pans over the Glasgow Necropolis, revealing the grimy city beyond, the film begins in earnest with Roddy, having the camera implanted. Almost immediately, Tavernier takes us into meta territory: when a nurse asks why Roddy would let the doctors “do that to you” he replies “do it to me? This way, I’ll never forget how pretty you are.” And then there’s a sharp cut: now we’re seeing through Roddy’s eyes, in grainy, lined video. We may as well be him, says Tavernier. Roddy and Vincent – though mainly Vincent, one feels – have cooked up Death Watch as a TV spectacular, and as Roddy wanders the city, he passes billboards advertising its debut. That they don’t have a subject yet seems a mere trifle, though they contrive – with the help of her pinched, sinister doctor – to land on Katherine Mortenhoe. What follows is in some ways a standard couple on the run yarn: Roddy and Katherine in a homeless shelter; in a street fight conducted behind some particularly grimy tenements; heading for the open country and escape from surveillance society, and eventually finding some sort of sanctuary, even if it comes at considerable cost. What makes Death Watch work – and it does work, though not as smoothly as it might wish; it’s a little too scrappy, with random bits of voiceover and odd, jarring jumps in tone – is that it roots this fable in a dirty, grimy reality: Glasgow as a location has rarely worked better, with Tavernier taking great advantage of its contrasts: the opulence of the NTV headquarters (exteriors: the cod-Spanish Baroque of the Kelvingrove Museum & Art Gallery; interiors: the marbled pomp of the City Chambers) appears cheek by jowl with urban scrubland that looks like a bombed-out future, but was in fact the result of post-war demolition. Struggle and violence are everywhere: More than once, Roddy passes people protesting or striking; every time, he passes on, ignoring their fight. This is a world which has been split in two: not quite to HG Wellsian levels, perhaps, but there is little doubt that this is a society which has atomised. (There’s a great, dramatic tracking shot through a combined refugee camp/street market which, as others have noted, prefigures similar antics in Children of Men by some 25 years.) In Death Watch’s nameless city – much as in countless cities the world over in the 30 years since the film’s release – the privations of the underclass (you would call them working class, maybe, if they had jobs to go to) are pushed out from city centres into rings of desperation. Here are the Parisian banliueus rendered out of Scottish stone and despair, echoing with the cries of Bill Douglas’ Trilogy. 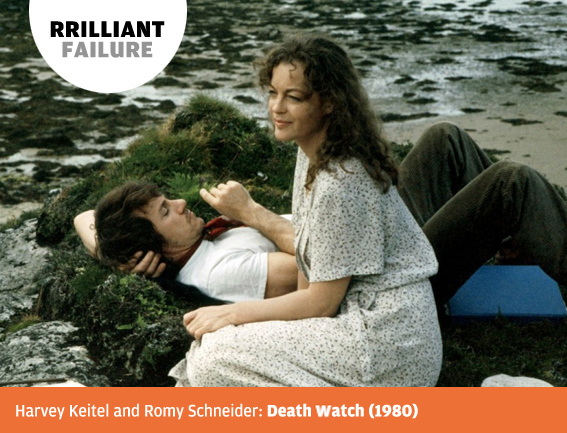 Upon its release, Death Watch failed: perhaps it was so mordantly bleak that even in the vein of dystopian sci-fi in which it flows, it was simply too convinced that it had seen the future, as Leonard Cohen once said, and it was murder. There are no cool interrogations of aliens; no stylised ultraviolence; there is just the bleak grind of survival in a world in which, to paraphrase Katherine Mortenhoe, ‘everyone is watching everyone else, but nothing matters’. Leon McDermott, Leon McDermott has written about film, music, visual art, television, literature, architecture and anything else that will pay the bills for, among others, The Herald and Sunday Herald, The Scotsman, The Big Issue, and Metro. He has been a contributor to The Culture Show (BBC 2) on visual art, and was Catalogue Editor for the Edinburgh International Film Festival for the years 2007 and 2008. He currently lives in north-east Scotland.